Do you hate when people ask you WHY you don't have kids? Learn how to answer these uncomfortable and awkward questions with confidence! In this video, we're talking about NOT having a baby. Maybe it's because you don't want kids, or maybe it's because of infertility – because you can't have one. 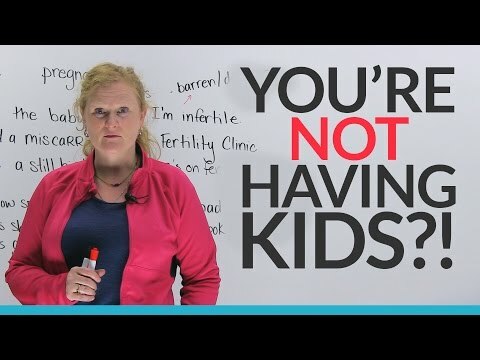 This video covers everything about not being pregnant; we'll talk about different issues that men and women can have that prevent them from having a baby. I'll explain the English vocabulary – both polite and slang – that you can use to talk about infertility. Take the quiz: www.engvid.com/so-youre-not-having-a-baby/ Make sure you watch these videos about HAVING A BABY: 1. https://www.youtube.com/watch?v=TrCSBtTADNU 2. https://www.youtube.com/watch?v=4JG4lKM3Wog TRANSCRIPT Hi there. I'm Ronnie. I've got something to share with you and it's quite personal, but it's just the kind of gal I am. I am infertile, so that means I cannot have children. You're thinking: "Maybe that's a good thing", or you're devastated that there'll be no baby Ronnies running around. Enh, at first I was devastated, but then I came to terms with it and I figured it was for the best. But there's these other things called other people, and they like a lot to ask me questions about it. So this lesson is from me, and I'd also like to put a dedication out to this to Melanie. This is for you. You gave me the inspiration for this video. Love you, girl. So, in a normal life process people are born, they get a boyfriend, they get a girlfriend, they get married, and then-ba, ba, ba, bom-they have a baby. But sometimes you don't get the baby. So, this lesson is entitled: "You Are Not Pregnant." And this is a really big issue with women around the world. Every country has different ways of helping or not helping women, so if you're going through this, there is lots of help available. Stay strong. You can do it. We have a slang term for the word "pregnant", we say "preggers". So, you might hear somebody say: "Oh my god, my best friend is preggers." And you say: "Preggers? Is that a person's name?" They're just meaning pregnant. Okay? We also have slang terms to say: "I have a bun in the oven." Oh, well, that would be delicious. Or: "One in the oven", that means that they are pregnant. But this is for everyone who is not pregnant. So, we're going to start with a very, very common term. Someone might say: "She lost the baby." And you think: "How could she lose a baby? They're... They're going to cry... It was... How can someone lose a baby? They're just... They're babies. How can you lose them?" They don't mean that they physically misplaced the baby. It means there was a problem, and the problems might be that somebody... She, obviously, had a miscarriage. "Having a miscarriage" means that after a few months into your pregnancy the baby doesn't survive. So it could be... We... We normally say in Canada that after three months of knowing that you're pregnant, three months is pretty much a safe time to let people know that you're going to have a baby. But that is no guarantee. Sometimes we'll have a miscarriage after three months, god forbid, but if somebody had a miscarriage it means that the baby wasn't strong enough to survive and the baby died. But it probably wasn't formed yet. Even more traumatizing than this is if the baby came to term, so maybe you went past the three months, four months, five months, six months, seven months, and what happens is you deliver the baby or you have the baby, but the baby's dead. This is called a "still birth". So the still birth means that the baby survives for the nine weeks up until you're going to go into labour and have a baby, but something happens and the baby dies. And this is... I couldn't imagine. Something really heartfelt and tragic. There are reasons why people cannot have a baby. As I said, I am infertile, this means that there is something wrong with my eggs and they're not strong enough to do their magic and their cell reproduction and actually make a baby. So I had to go to what's called a "fertility clinic". Now, "infertile" is an adjective, and in slang you can say: "She's barren" or some people might say: "She's dried up". Now, these terms: "barren" and "dried up", you guys must understand that these are slang and probably not really cool to say to the person who is infertile. If you want to talk to them about it, cool, but it's better to just say they're infertile. "Barren" or "dried up" we would make jokes with. What happens when you go to a fertility clinic is many different things, but the first thing that they do is they put you on fertility drugs. Now, these are pills or some kind of drugs that you can take to help you in whatever your problem is. There could be a problem with your eggs, there could be a problem with the inside of your body. Видео So you're NOT having a baby... будет очень полезно тем, кто хочет выучить английский язык.